Why Aren’t All Other Dioceses Looking to Lincoln? Where Can “Mutual Enrichment” Really Take Us? Ad Orientem - How’s It Going? The Roman Ritual contains two different forms for the blessing of wine on the feast of St John the Evangelist. The first consists simply of three prayers; the second is slightly more elaborate, with three different prayers, preceded by a Psalm and a series of versicles. Both versions contain references to the origin of the blessing, an interesting example of how the Church has embraced and preserved a non-Biblical story about the life of an Apostle. Many people have heard of New Testament Apocrypha such as the Protoevangelium of James, the traditional source for the names of the Virgin Mary’s parents and the story of Her presentation in the Temple. Some of these have had a significant influence on the Church’s devotional life and its artistic traditions. Irresponsible scholars have also created a whole cottage industry of foolish writings about Our Lord and the early Church based on some of the Gnostic Gospels, while generally ignoring the apocrypha of the New Testament’s other literary categories, Acts, Epistles and Apocalypses. Like the apocryphal Gospels, the majority of these were clearly written to lend credit to one heresy or another, and therefore rejected by the Church. In some cases, however, once the heresy in question had faded into obscurity, the relevant apocrypha regained popularity, since their heretical content was no long understood or perceived as such. One example is the apocryphal Acts of John, a work of the second century with strong overtones of the Docetic heresy, which taught that Christ had only the appearance of a human body. 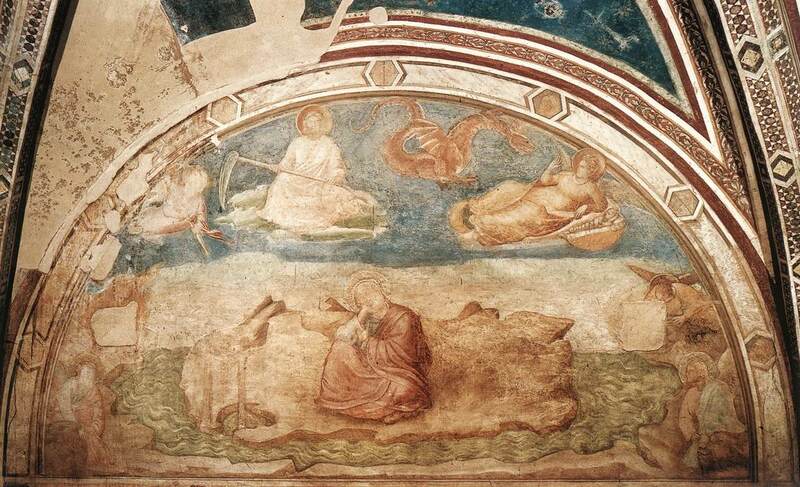 It tells the story that when St John was brought before the Emperor Domitian (81-96), he offered to prove the truth of his preaching about Christ by drinking a deadly poison, in accordance with the Lord’s words at the end of St Mark’s Gospel (16, 18), “if they shall drink any deadly thing, it shall not hurt them.” The poison did him no harm; this has given rise to the traditional representation of John holding a chalice with a serpent or dragon emerging from it, symbolizing the poison, and its effectiveness, leaving the cup. 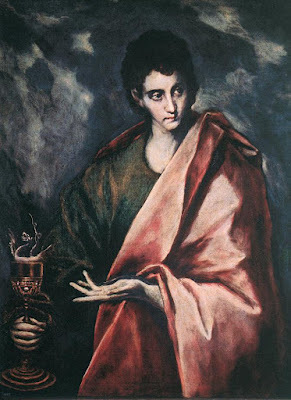 St John the Evangelist, by El Greco, 1604, now in the Prado Museum in Madrid. When the Emperor thought he had been saved by trickery, its toxicity was proved on a condemned prisoner, who died instantly, but was later raised to life by John. For this, he was exiled to the Greek island of Patmos, as recorded in the authentic book of the Apocalypse, where he stayed until the death of Domitian; when the acts of the latter were rescinded by the Senate on account of his extreme cruelty, (as reported by St Jerome), John was permitted to return to Ephesus, where he lived out his days. 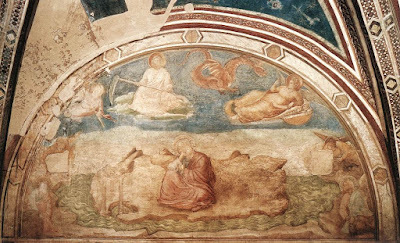 St John’s Vision on Patmos, by Giotto, 1317-20, in the Peruzzi Chapel of the Basilica of the Holy Cross in Florence. The second version of the blessing begins with the Psalm “The Lord is my shepherd”, certainly chosen because of its most famous verse, “Yea, though I walk through the valley of the shadow of death, I will fear no evil,” as well as for the words “my chalice which inebriateth me, how goodly is it!” The versicles said after it include the verse of St Mark’s Gospel mentioned above. The first of its three prayers begins with an explanation of the Incarnation: “Lord, holy Father, almighty and eternal God, who willed that Thy Son, coeternal and consubstantial with Thee should come down from heaven, and be incarnate in the world of the Virgin Mary in this fullness of time.” The last part of this beginning, “this fullness of time”, rather than “the fullness of time”, seems to refer to the Christmas season, in which the Divine Incarnation is made manifest, as witnessed by St John above all others, and in which his feast day is kept. The prayer continues, “that He might seek the lost and wandering sheep and bring it back to the sheepfold upon His shoulders; and further, that he might cure the man who fell in among thieves from the pain of his wounds.” This refers to a story recorded by St Clement of Alexandria, and repeated by Eusebius in his Ecclesiastical History (3, 23), that a young convert of St John turned to a life of violence as a brigand; the Apostle, though now very elderly, pursued the fellow into the mountains where he was wont to hide, and brought him to repentance. The second prayer says, “Lord Jesus Christ, who willed Thyself to be called the true Vine, and Thy Holy Apostles the branches”, citing the long discourse of Christ at the Last Supper recorded only in John’s Gospel. The third adds a reference to the creation of bread alongside the fruit of the vine, in reference to the Eucharistic discourse of chapter six of the same Gospel; it also says that John “not only passed unharmed from the drinking of poison, but also raised from the dead those laid low by poison”, referring to the story of the prisoner cited above.